As the 2018 Major League Baseball season begins to wind down, the race for the coveted Cy Young Award is just heating up. Named after Cy Young, the winningest pitcher of all time, the award is meant to honor the best pitcher in both the American and National Leagues at the conclusion of each season. This year’s National League race is just as competitive as ever, with four standout candidates based on several statistical categories: Jacob deGrom of the New York Mets, Max Scherzer of the Washington Nationals, Aaron Nola of the Philadelphia Phillies, and Patrick Corbin of the Arizona Diamondbacks. What makes this award so fascinating and hotly debated is the subjectivity of the term “best pitcher.” There are numerous factors that determine if a pitcher should be considered for this award, and what one voter thinks is important may be different than the next. The winner of the award is voted on by the Baseball Writers’ Association of America, and has been since the award’s introduction in 1956 by then commissioner Ford Frick. For the first ten years, the award was only given to one pitcher in the league, but was changed to honor a pitcher from each league after Commissioner Frick’s retirement in in 1966. Don Newcombe was the first winner of the Cy Young Award with the Brooklyn Dodgers the year before the franchise moved to Los Angeles. Unlike some awards, it is not uncommon for players to be honored with the Cy Young Award multiple times in their career. Sandy Koufax was the first to repeat in 1963, 1965, and 1966, and it has been done sixteen times since then. Roger Clemens as the most of these awards with an impressive seven, his first in 1986 and his last in 2004. Max Scherzer is the only one of this year’s top choices to have a previous win, as he earned the honor in 2013, 2016, and 2017. I mention this trend only to clarify that previous wins do not exclude Max Scherzer from consideration this year. In order to determine which of these candidates should take home the trophy, I’ll use a point system for each factor. The top pitcher in each category will earn four points, the second best will earn three, the third will earn two, and the last will earn one. In the event of a tie, each pitcher will get the higher number of points. I’ll keep track along the way and use these numbers to determine who should win the award, although no promises it will match my prediction. The pitcher with the most points after taking these categories into consideration is who should win based on these stats. My prediction for the winner will include a few other factors. In no particular order, the first consideration for each of the pitchers is ERA, or earned run average. La Marr Hoyt had the highest ERA of any Cy Young winner with 3.66 in 1983. The average ERA in the American League that year was 4.06. The average ERA of previous Cy Young winners is 2.51. Leading the pack of this year’s top options is deGrom with 1.71. Scherzer and Nola are tied for second with 2.13, and Corbin follows at 3.17, still well within the range of past winners. The next factor to consider is how many walks the pitcher gives up. Walks are a way to assess a pitcher’s accuracy on the mound. Jacob deGrom is best in this category as well, issuing 2.1 walks per nine innings. Corbin and Scherzer tie for second with 2.2, and Nola with 2.4. Next: strikeouts. While strikeouts aren’t the only effective way to make outs, they are an important tool to show the value of a pitcher in making his own outs without the aid of his defense. Scherzer leads this category with 12.1 strikeouts per nine innings. deGrom comes in second with 11.1 strikeouts per nine innings, followed by Corbin with 11. Nola brings up the rear with 9. More specifically, swing and miss percentage indicates how well pitchers can hit tough spots and fool batters. Scherzer leads this category with 16.1%, meaning batters swung and missed at 16.1% of his pitches. Corbin and deGrom are tied for second at 15%, and Nola comes in fourth at 12.1%. Ground balls are another effective way to get outs. Ground ball percentage is an important statistic for a pitcher because grounders do not have the potential to leave the park and do not result as often in extra base hits. This excerpt from fangraphs.com shows the importance of the statistic: “In general, ground balls go for hits more often than fly balls (although they don’t result in extra base hits as often). But the higher a pitcher’s ground ball rate, the easier it is for their defense to turn those ground balls into outs. In other words, a pitcher with a 55% ground ball rate will have a lower BABIP on grounders than a pitcher with a 45% ground ball rate.” Aaron Nola leads this category with a 50% ground ball rate, followed by Corbin with 48.4%, deGrom with 44.8%, and Scherzer with 36%. Something interesting to note is that with these four candidates, ground ball percentage and stikeouts per inning have an inverse relationship. This means that, for example, although Aaron Nola doesn’t strike out as many batter as Max Scherzer, he converts many more ground ball outs. Next we’ll move onto home runs. MLB players are on pace to hit almost 5,700 home runs this year, a benchmark only passed once in history in the 2017 season when players combined for a whopping 6,105 home runs. As teams come to rely on the home run more and more, pitchers’ ability to keep balls out of the stands has become more important. Once again, deGrom comes in first place in preventing the home run, giving up 0.41 home runs every nine innings. Nola follows closely behind with 0.43. Then comes Corbin with 0.61, and finally Scherzer with 0.89. In order to measure command and control on the mound, we’ll take a look at wild pitches. deGrom has impressively not thrown a single wild pitch in the 2018 season. Nola comes in second with 3, Scherzer follows with 4, and Corbin brings up the rear with 6. Catching also contributes to wild pitches, but each team’s wild pitches do not correlate with the above order enough to be a compelling factor in the pitchers’ performance. FIP, or fielding independent pitching, measures a pitcher’s effectiveness at preventing home runs, walks, and HBP’s, and causing strikeouts. These stats are important to measure because they are an indication of how a pitcher works without the involvement of the defense. FIP is set up using ERA as a constant, meaning theoretically a 2.00 ERA would indicate the same amount of talent as a 2.0 FIP. deGrom is on top again with 20.7, followed by Corbin with 2.37, Scherzer with 2.63, and Nola with 2.66. The final category to look at for these pitchers is WAR, or wins above replacement. Essentially, WAR sums up a player’s total contribution to his team. To read a more in-depth explanation of WAR, check out Ian Joffe’s article by clicking here. Scherzer is at the top of the list with 8.8, followed by Nola with 8.6, deGrom with 7.7, and Corbin with 3.8. Based on these categories, there seems to be a clear winner in Jacob deGrom. He is the current leader in five out of the nine measured categories and does not fall last in any of the other four. However, he is not my pick for the award. This is because of his 8-8 record on the season. While I am very aware that there are many factors outside of deGrom’s control when it comes to his record, this is still a poor reflection on him and will probably away turn voters that place importance in the win-loss category. Only two players have ever won a Cy Young with a winning percentage of 50% or less, Bruce Sutter in 1979 and Eric Gagne in 2002, but they were both closers. To clarify, I would vote for deGrom because of his obvious advantage in the above categories. However, I do not believe the voters will do the same because they will take record into account more than I would. Despite the statistical support in favor of deGrom, I believe the 2018 NL Cy Young Award will go to Max Scherzer for a few reasons. He leads the league in WAR among pitchers and is tied for the most wins with 16. He has also pitched the most innings out of any pitcher, meaning he goes deep into games, a skill that is becoming more rare. Furthermore, he has played for the most seasons by far out of an of the top candidates and, as mentioned above, is already a three time winner of the Cy Young Award. This means that he has the respect of the voters as a veteran and has proven his skill many times before, as well as showing his consistently commendable skills time and time again. Check out my articles about The Phillies’ Odúbel Herrera and top prospect Sixto Sánchez, or take your pick of tons of interviews and articles here. 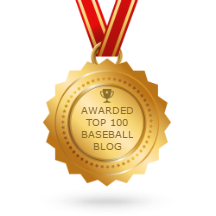 Follow The K Zone Blog on Twitter to get updates on baseball and notifications about new articles. All credit for images goes to original owners. Maddie is a 16 year-old Philadelphia native with a passion for writing and of course, the Phillies. When her cousin, K Zone founder Mike Duffy, asked her to write for the blog, she was ecstatic, because it combined her two favorite things: writing and baseball. Her all-time favorite players are Chase Utley and Carlos Ruiz. Aside from baseball, she also enjoys reading and writing poetry, singing, and traveling. She is also a big fan of her other beloved Philly sports teams; the Eagles, Sixers, and Flyers. Maddie appreciates the need for sabermetrics in baseball, but also thinks that you can't tell everything about a player from a stat sheet. This is a great article, and better than the ones i made on Fangraphs community research page. Hi, thanks for pointing out my error! It’s been fixed. Hey ignore that other jerk, I thought this was a good look at the Cy Young race. Personally, I think deGrom deserves it, but I can also see Scherzer winning again because he is such a workhorse. That is something that will be valued by voters. Good work on the article, keep it up! Who’s Mark Corbin? Some guy by the name Patrick Corbin pitches for the Dbacks…. which of the pitchers has been more impactful for their teams? Nola and Corbin have made their teams playoff contenders. This is an absolutely rubbish article that is rather self-contradictory. What are you r sources for WAR? Both Baseball Reference and Fan Graphs list deGrom with a lead on Scherzer of 1.5, and a BR lists both Kyle Freeland and Aaron Nola ahead of Scherzer.